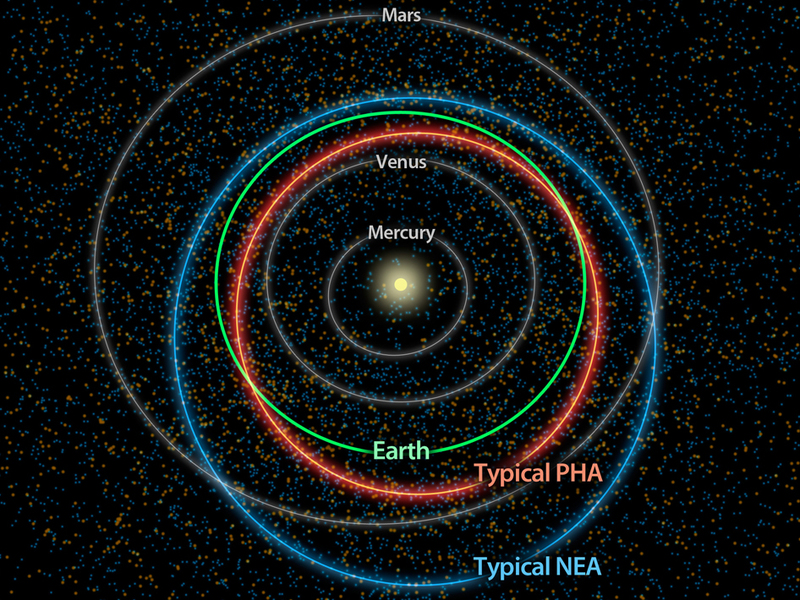 Diagram showing a typical Near Earth Asteroid in blue and a Potentially Hazardous Asteroid in red (Credits: NASA). This is the third and final article in the series “Taking Potentially Hazardous Asteroids (PHAs) Seriously” by Joseph N. Pelton, President, International Space Safety Foundation and Chair, IAASS Academic Committee. It is not enough for the public to be aware of the threat of near-earth asteroids and to develop the tools to track potentially “killer NEOs” so that we can identify true threats to humanity from outer space. The third part of the equation is to develop tools that could save us from devastation, if not extinction. There are five will documented mass extinction events that killed over a third or more of all species on Earth. Four of those mass extinctions involved major climate change events and elevated heat levels on the planet. The other one is thought to have involved a massive asteroid crashing to Earth. The avoidance of another mass extinction event while over 7 billion people inhabit planet Earth would seem to be a good idea. The question is how to go about preventing a “killer NEO” from snuffing out life when the risk of a collision becomes reasonably well known. In the movie version, the detection is made at the very last moment and a nuclear explosion is detonated at the very last moment. In the scientific version of threat aversion, the detection is made decades before the projected collision is to occur and the method of diversion might involve just a minor course alteration to eliminate the threat. The European Commission has started a serious attempt to develop new technology to protect against rogue asteroids hitting Earth and this activity is known as “NEOShield”. This new international consortium consists of a wide number of research institutes, universities, and industrial and scientific partners in France, Germany, Russia, Spain, the United Kingdom, and the United States. Its prime purpose is to explore the best strategies to cope with future detected NEO threats. Although NEOShield will explore a wide range of possible strategies, the prime focus will be on the most likely strategies. These are currently considered to be kinetic impactors, gravity tractors, and a explosive blast-deflection method that could involve conventional chemical explosives or atomic weapons. Alan Harris of the German DLR Aerospace Center’s Institute of Planetary Research in Berlin-Adlershofis is NEOShield’s project leader . NEOShield was launched in January, 2012. The purpose of this multi-national research effort is to find means to prevent near-Earth objects, such as asteroids and comets, from colliding with Earth. Funding has been allocated to the consortium by the European Union with an initial budget of four million euros. Kinetic impactors would involve firing missiles at near-Earth objects to divert their orbital paths. The research analysis is seeking to identify the effect of different types of projectiles hitting various types of analog asteroid surfaces. Thus the experiments will explore what might happen with different types of “potato-like structures” of different compositions, different densities, and different porosities. The idea is to understand what type of momentum transfer occurs with such a kinetic impact with various types of asteroids that are of different chemical compositions and shapes. Gravity tractors would involve very gradual orbital changes for the NEO over a long period of time such as a decade or more. This would involve precise robotic flying, presumably using ion engine thrusters to “bend gravitational space” just enough to create a significant orbital shift for a “killer asteroid” so as to remove its threat to Earth. Explosive blast-deflection we have seen depicted in movies. This would involve sending some form of bomb to push the asteroid in new directions or to blow it up. The thought behind this technique is that it would be applied when the detection of the threat was quite late and that there is a need for a very rapid, emergency response. The idea of the research consortia and the current action program seems to make a good deal of sense, although perhaps other nations might be added to the research network. The problem is that 4 million euros for a four year international program is anemic indeed. More money is needed for every aspect of this program on which the entirety of human survival may ultimately depend. Joseph N. Pelton is the former Dean of the International Space University and is currently working on a book, Space Threats, that will address Potentially Hazardous Asteroids, Coronal Mass Ejections, Cosmic Radiation, and Space Debris .